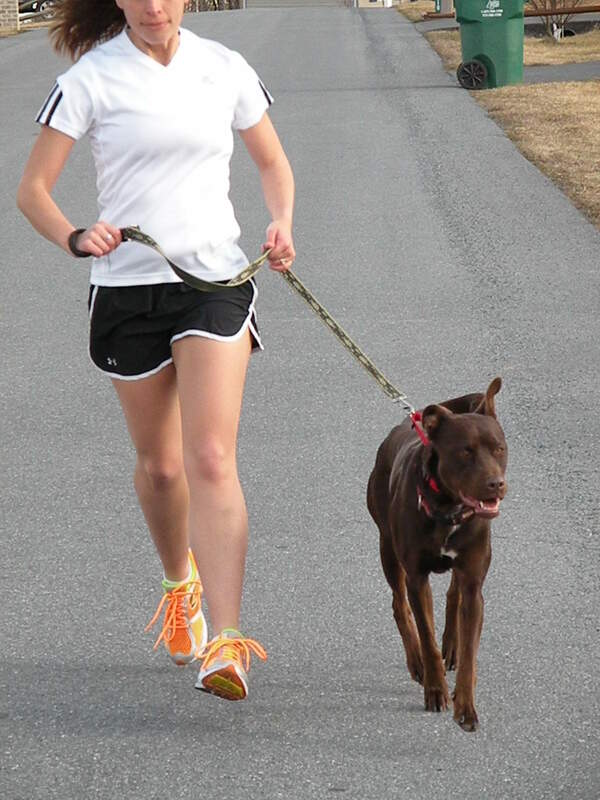 Running with a dog isn’t exactly rocket science but it can be a little frustrating and have a learning curve at first. The good news is it’s very easy to train a dog to run by your side on leash. Most pick it up quickly and will be running in perfect pace with you in no time, often improving their behavior on a leash for both walking and running. 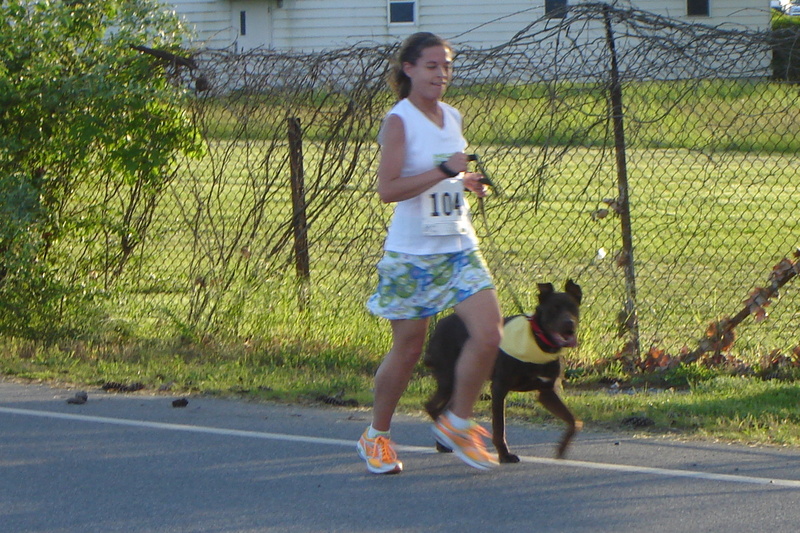 Running is a task that forces the dogs to concentrate more than they would on a leisurely stroll. 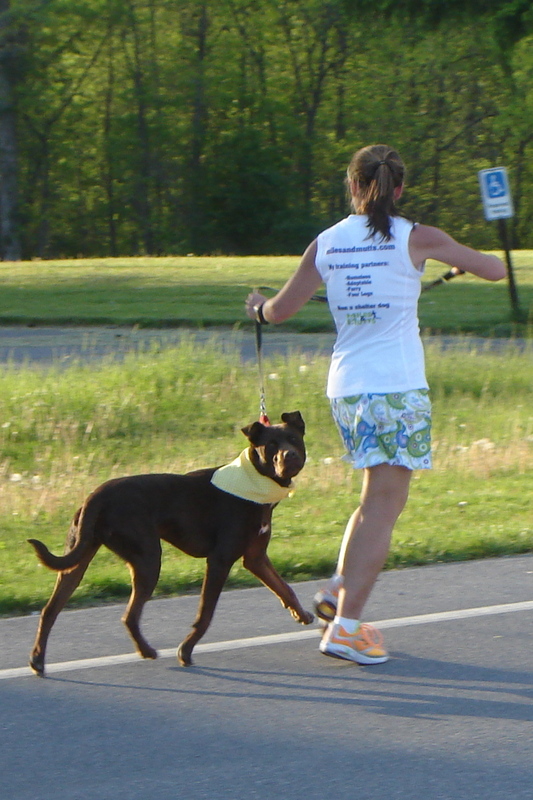 This makes it easier for a higher energy dog to get into a zone while running over walking. I’ve run and walked many, many dogs over the years and have tried virtually every kind of harness, collar, head collar, leash and waist belt manufactured. Most of these products have their place in the market. However, what I have found works the best for running with the majority of dogs is very simple – a 4 foot lead attached to a Martingale type collar. My absolute favorite 4-foot leads are those made by Lupine. I purchased my first one somewhat by accident. I was bringing home another dog and realized I didn’t have enough leashes for all of the dogs in my house. I was at a local store that did not stock a lot of supplies but they had a few Lupine products for sale. I bought a leash and did not even realize that it was a 4-foot lead instead of the more typical 6-foot lead that you’ll find in most stores. It quickly became my absolute favorite leash for a variety of reasons. First, 4-foot is the perfect length for running. It is short enough that you can keep the dogs by your side and not have too much slack to deal with. Second, you’ll quickly discover the handle is much better than a standard leash handle. It is slightly padded, fitting perfectly into your hand. Additionally, it is connected to the lead with a metal connector. This allows the handle to stay firmly in your hand while the leash still moves around a bit while you are moving and pumping your arms during running. Third, the clasp is easy to connect to the collar D-rings. The clasp is much sturdier and lasts longer than other brands. Finally, the nylon holds up very well, even after many, many miles and plenty of rounds in the washing machine. And, as they state, they are guaranteed (even if chewed). A guarantee like that probably means they are pretty high quality! Well loved lead on the bottom, brand new lead on the top. 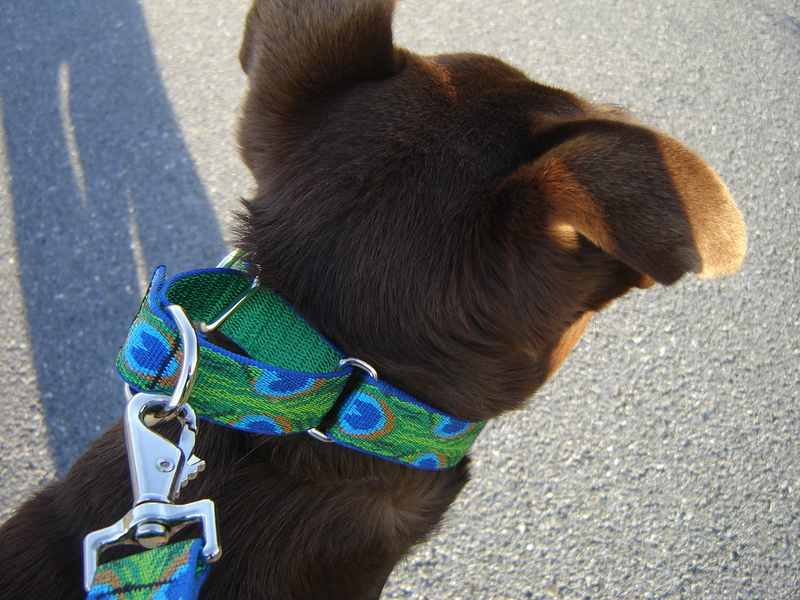 Martingale style collars go by many names but the idea is simple. The loop has a ring which attaches to the lead and tightens if the dog pulls or tries to back out of the collar. 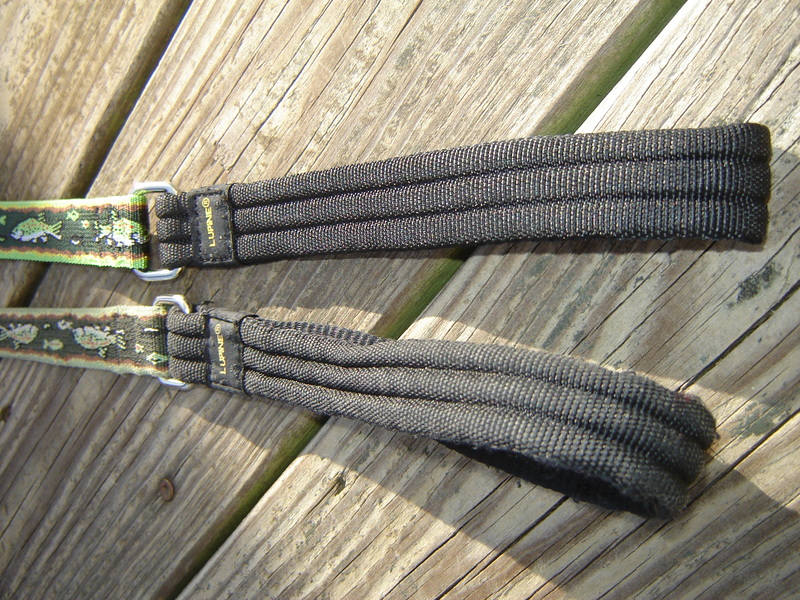 They are not restrictive like a choke collar but tighten enough to allow for training the dogs not to pull. 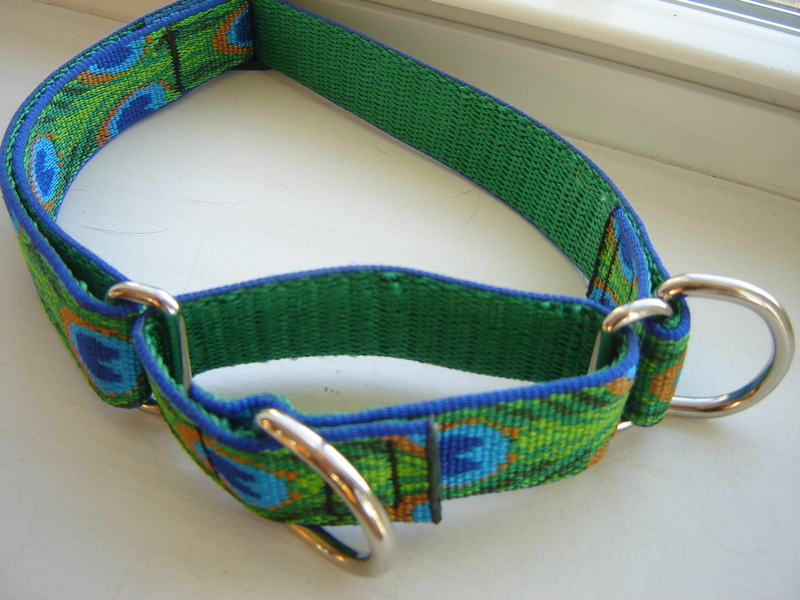 Lupine makes a Combo collar which can be used as a training type collar (D-ring in the front of picture) or a regular collar (D-ring on the right). For running, I always use the martingale loop. It should be noted that these types of collars should not be left on dogs unattended due to the tightening feature of the looped section. 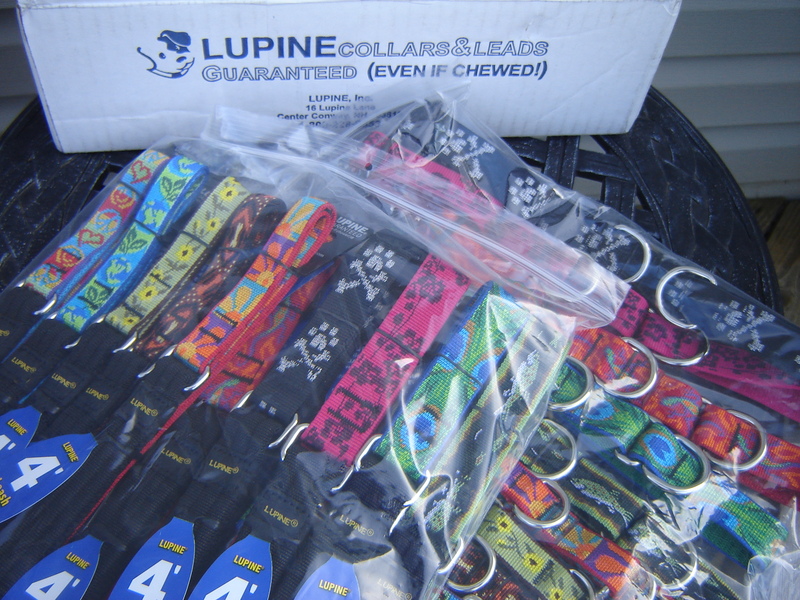 The Lupine collars are high quality just like the leads. The only drawback with this style of collar is it is an over the head type. 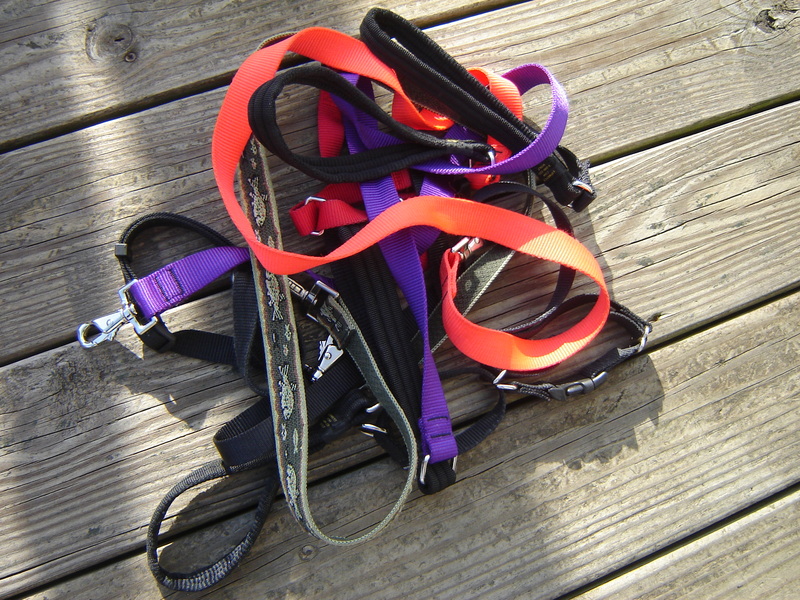 This makes it a little more difficult to fit on the animal shelter dogs as opposed to those that also have a buckle. The shelter dogs are usually quite excited and not overly patient to wait on the human’s ability to re-size the collar a couple of times before getting it right! This type of collar is the only type that I’ve never had a dog be able to get out of in some way. With virtually all other types of collars or harnesses, dogs who really want to try to get away from you to chase something usually can but I’ve never had it happen with this type of collar. This is particularly important when running with the shelter dogs since they sometimes get spooked by something and try to get away. To start running with a shelter dog, I slowly move into a jog. For the first quarter of a mile or so, I let the dogs go in which direction they want which often includes some zig-zagging. If running with my own dogs, I discourage the zig-zagging and start them directly on my left side. After the dogs start to figure out what we are doing, I begin to reel them in to my side. To do so, I grip the lead about halfway down to encourage staying on my left. Usually, they’ll fall into pace after practicing a few times and you can run with a slack lead. 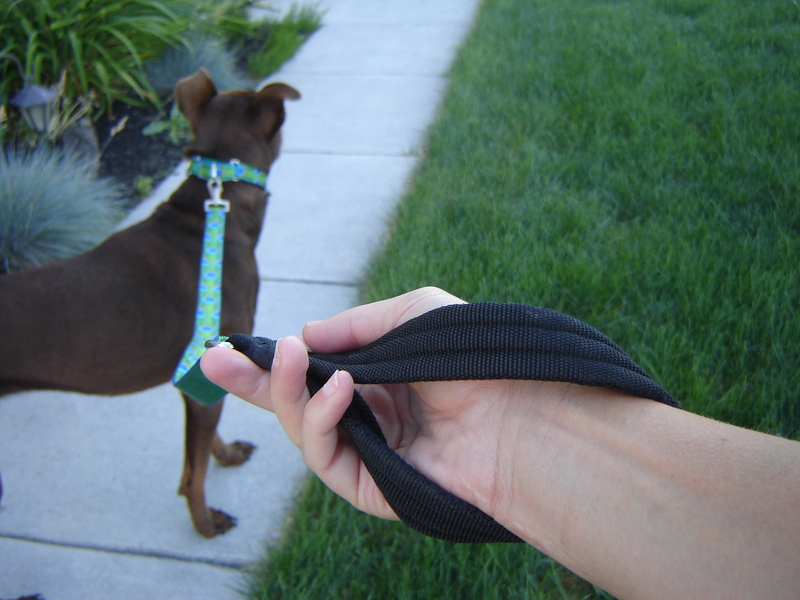 If the dog gets distracted, usually it is easy to pull up on the leash and collar to redirect the dog straight ahead. With a little experience on the dog’s part and a little patience on the human’s part, you’ll be running together harmoniously in no time. Miles and Mutts has been using Lupine leads and Martingale style collars to run with the dogs. Often, we were scrounging for enough supplies to make due for the day when multiple dogs were involved. My previous stash that I guarded closely! After contacting Lupine and talking with their incredible customer support, Miles and Mutts runners now has the appropriate collars and leads in the correct sizes. Thank you Lupine! Interested in running, join us! Thanks for the review, very interesting stuff! Nice they gave you some supplies!!! This is great info, Abbi. Thanks! Hi Abby! I found your blog and this site via your guest post in Mommy, Run Fast! I love this idea! My two dogs I adopted from shelters and always wondered about those guys getting some exercise! I am going to check with my shelter and see if they have a program. By the way I agree that the 4-foot leads from Lupine are the best! I also use a martingale collar on my wheaten terrier and it works so much better! What great advice! My whippet (a shelter pup) is my running buddy. She’s great company! I do have issues w/ her freaking out when we meet other dogs…any advice there? She’s not aggressive; she just wants to play so badly that she yips and pulls. I use a halti on her because I can’t hold her otherwise. Yay for your great running buddy! If having her on a short lead and leash corrections with the halti do not work to keep her close to you and focused, perhaps try working on training to redirect her focus to you by either a word or sound? I’m not a trainer but just from experience I’ve worked on this with one of my own dogs. Before he gets too excited, I try to get him to look at me. I started with treat based training to work with him on it so he looks at me whenever I make a clicking type sound and usually (not always), it helps to keep him focused on walking/running instead of whatever other distractions are around. 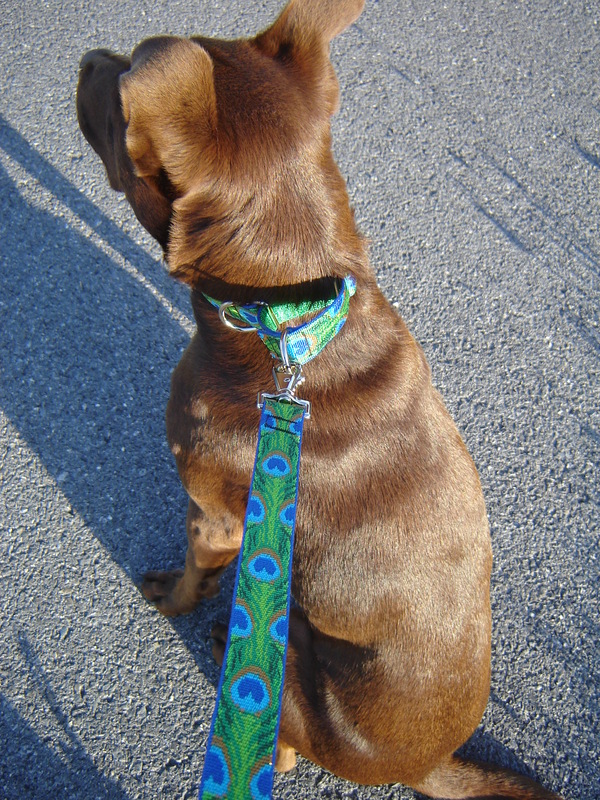 All this time trying to get my dog not to pull on the leash and I never discovered martingale collars?? Thanks for this info! I’m buying one ASAP! Good luck! Try to keep it high on her neck too. If she’s really bad, the Gentle Leader Easy Walk Harness works well on some too…it’s the one that attaches to the leash in the front/chest area.